Powerful, fast, and easy to use audio conversion for AMR, MP3, WAV, WMA, OGG, and many more audio formats. AMR Converter Pro makes conversions for cell phone audio files a quick and easy task. Settings are provided for bitrate, frequency, channels, and more. Convert from AMR, MP3, WAV, WMA, OGG, AAC, AC3, AIFF, AU, VOX, RAW, PCM, ADPCM, A-LAW, u-LAW, MP2, FLAC, ALAC, CD, M4A, MP4, WavPack, etc. to AMR, MP3, WMA, WAV, or OGG with ease. AMR Converter Pro can also be used to change the compression for supported formats. The comprehensive range of supported formats makes the software very flexible, and provides a complete solution for conversion of most any audio file desired. Conversions are performed directly from format to format, which increases conversion speed and eliminates potential quality loss. The ability to automatically transfer audio tags from the source format to conversion output is also present. AMR Converter Pro offers an extensive array of options for complete control over how the software functions. The software is fully functional and can be utilized easily by users of any experience level. Conversions can be performed on an entire folder of files simply by using the Add Folder option. Furthermore, when converting a folder, you can specify an option for all subfolders to also be included. Additional built-in options include: the ability to automatically use the source file's path for conversion output, overwrite protection (append unique numeric value to the base filename for existing files), deletion of source file(s) after successful conversion, and much more! Recent Changes: Complete redesign of conversion engine for all formats. Many enhancements and improvements for more format output options, improved memory management, and faster conversion times. visual audio editor, recorder, converter and player and it's free. 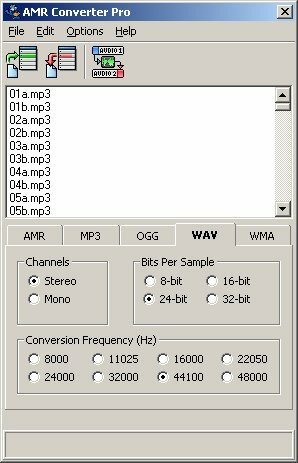 Free converter supporting WAV,WMA,WMV,FLV,MP3,OGG,FLAC,M4A,RA etc.